Laboratories have traditionally collected liquid chemical waste in whatever glass container is available without much regard to the potential risk of using that container. Unfortunately, this often resulted in emergency response calls caused by broken collection containers or knocked over containers with improper lids. As a way to provide an increased level of safety, compliance, and efficiency, Triumvirate has found a solution to these traditional methods. 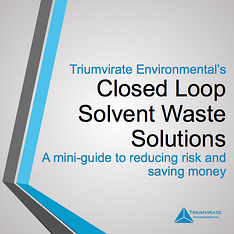 This guide provides a side-by-side comparison of the two methods and addresses several questions you might have about the new closed-loop solvent waste system. The guide specifically applies to waste collection directly from a piece of equipment requiring tubing for constant collection.